Velvet Paw Creations: "Black Cats and Pumpkins" altered domino bracelet for my DominoART's 31 Days of Halloween blog hop with Smeared and Smudged! "Black Cats and Pumpkins" altered domino bracelet for my DominoART's 31 Days of Halloween blog hop with Smeared and Smudged! 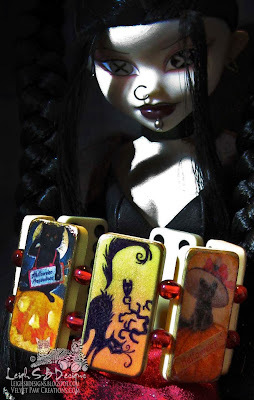 My DominoART's 31 Days of Halloween Scarefest that's taking part in the Smeared and Smudged Blog Hop is well underway and so far has been truly spooktacular! 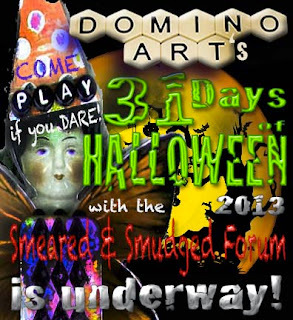 Click on the 31 Days of Halloween banner below to go to Day 1 if you'd like to see all the altered game art featured by my Wicked Players so far and click HERE to go hopping with Smeared and Smudged..all the deets are in my Day 1 post too! 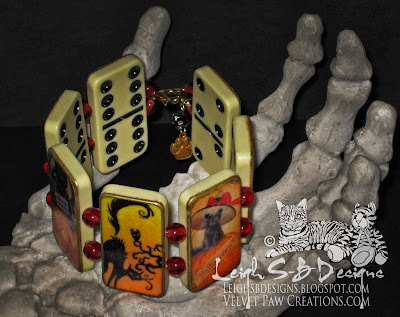 Click the photo below to see my project altered domino bracelet project for Day 6!